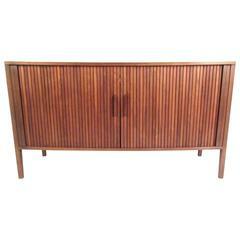 Vintage modern walnut credenza featuring many sculpted wood detail throughout, three drawers and a spacious storage compartment. (Please confirm item location - NY or NJ - with dealer). 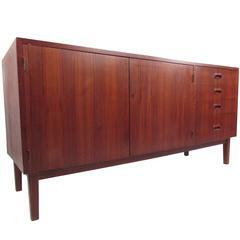 Sleek vintage modern credenza features spacious storage cabinets, small drawer, black lacquer body and burl wood doors. Please confirm item location (NY or NJ). This is a beautiful refinished mahogany credenza with a walnut stain, featuring an upholstered pressure-hinge door with shelving and four dove-tailed drawers.